After a relatively uneventful week of college basketball, the first few days of the upcoming week won�t be much better. Starting on Thursday, however, there may not be a better stretch of games all season, and Saturday will undoubtedly be the most entertaining day of basketball so far this year. Georgetown and Memphis will be the biggest game of them all, but other games this week include Texas and Michigan State, Duke and Pittsburgh, and Tennessee at Xavier. And not only do you have those monster matchups, but there�s also a full slate of games this week with less hype that could be just as fun to tune in to. The only knock on this game is its somewhat early start. Other than that minor inconvenience, when Georgetown and Memphis get together this Saturday, the two teams will provide the season�s first true showdown between elite teams. The Hoyas are in for their first test of the season, and while Memphis has nice wins over Connecticut, Oklahoma, and USC, the Tigers will finally get the chance to face an equally talented team. One of the keys to the game, on both sides, will be to control the tempo of the game. Georgetown will need to make sure the game is not played at the fast pace Memphis would prefer, but the Tigers proved in their 62-58 overtime win over USC they can play a more deliberate pace as well. However, if John Calipari�s team can get out and run, the Hoyas may be in for some trouble. Make sure to keep an eye on the battle in the paint, between Georgetown star Roy Hibbert and Memphis big man Joey Dorsey, who must stay out of foul trouble, something he couldn�t do after calling out Greg Oden in last year�s Elite Eight game. Memphis� depth at the guard position may prove to be the difference, and guarding Chris Douglas-Roberts seems to be an impossible task at this point. After adding to his slashing game with a greatly improved outside shot, Douglas-Roberts is quietly having an outstanding season, averaging over 20 points per game. 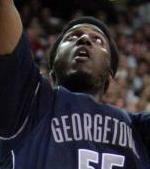 Saturday�s game will tell us a lot about both teams, but the game will be more telling of Georgetown�s potential this season. The only major-conference victories the Hoyas have this season are against mediocre Michigan and Alabama teams. John Thompson may be able to withstand Jeff Green�s departure, but to this point, it is impossible to tell. If the Hoyas beat Memphis on Saturday, though, it won�t be an issue anymore. Although Memphis hasn�t quite faced a truly marquee opponent this season, several major-conference wins, especially over USC in a hard-fought overtime battle, show that the Tigers are obviously capable of a run to the Final Four. Nobody remembers Grand Valley State�s improbable exhibition victory anymore, and you can credit Tom Izzo for leading his team to an outstanding start this season. If it weren�t for a collapse against UCLA in the CBE Classic Finals, Michigan State would probably be undefeated. Texas, on the other hand, did defeat the Bruins, as well as dismantle Tennessee, and Rick Barnes� Longhorns have jumped inside the top five of the polls after a surprisingly dominant start. With nine players averaging more than 14 minutes per game, Izzo has a lot of options. This is especially true at the guard position, where freshmen Chris Allen, Kalin Lucas, and Durrell Summers have helped star Drew Neitzel in the backcourt. Everyone knew Raymar Morgan was good, but it�d be a stretch to say we saw his early season performance coming. The 6 foot 7 forward has done it all this season, and he�s getting help inside from Goran Suton, who is using his massive frame to grab 9 rebounds per game. The Longhorns have had a surprising performance of their own in big man Connor Atchley, who has shown massive improvement over last season. Atchley will need to step up in this game and play big down low, and if he can hold his own, Texas� fantastic guards will produce as usual. Damion James, a bit small for a forward ad 6 foot 7, has really carried Texas on the boards though, even though Atchley�s size is more traditional for a big man. In all areas of the game, these two teams are almost completely evenly matched. Either team may come out on top, but Michigan State on its home floor will be tough to beat, especially when the Izzone is revved up in full force. So Pittsburgh says it wants to crank out a faster pace and run more this season with the departure of plodding big man Aaron Gray. When Duke comes to town on Thursday, Jamie Dixon will find out if this plan of his will work or not. So far, it has, and Pitt is off to an undefeated start. However, the Panthers have not played anyone this season, with their best wins being against two lesser major-conference teams in Washington and Oklahoma State. Duke will provide a stiff test to Pitt�s attempt to speed up the game, because for the first time this season, Pitt�s opponent will be able to match their athleticism. The Blue Devils� biggest weakness has been the lack of production down low. Freshman DeJuan Blair will be a force for the Panthers, just as he has been all season, beginning his college career averaging close to a double-double. Pittsburgh rarely loses at home, but Duke has looked like the Duke of old this season, so this game will be battle for the entire 40 minutes. After beating Indiana and Creighton, Xavier�s recent blowout loss to Arizona State is baffling. Besides that slip-up, a win over Indiana speaks for itself, and this Musketeers squad has shown it is capable of beating anybody. Final Four predictions for Tennessee were rampant in the pre-season, but after a pretty unimpressive start to the season, with a double digit loss to Texas and close calls with Chattanooga and Western Kentucky, those predictions have cooled. Still, the Vols have not changed since then, and they still boast one of the nation�s best shooters in Chris Lofton, who has suffered through a slump recently. Xavier may be at home, but Tennessee has one of the more explosive rosters in the nation and will be a tough task for the Musketeers. For a team ranked in the top 3, Kansas sure doesn�t seem to be getting for much attention. Wins over Arizona and USC should be enough for the Jayhawks to get some love from the national media outlets. Maybe it�s because of the lack of a top freshman player, but whatever it is, Kansas has played like a top team this season. Georgia Tech has played a tough non-conference schedule but has lost to all of its formidable opponents. If the Yellow Jackets could somehow find a way to win this one at home, it would provide them with a great out-of-conference, statement win for the NCAA tournament committee. Even though Kentucky and Louisville come to mind when considering the top non-conference rivalries, the Busch Braggin� Rights game between Illinois and Missouri in St. Louis is right near the top. The Illini have dominated the series recently, and the Tigers have not even won since 1999. Last year�s game came down to the final possession though, and Missouri will head to St. Louis with a great shot to finally knock off Illinois. The Illini�s guard play has been extremely shaky this year. They will need to take care of the ball against Missouri�s pressure defense, and this especially applies to point guard Chester Frazier, who has turned the ball over at an alarming rate this season. If Illinois can limit turnovers and take advantage of Shaun Pruitt�s size in the paint, the Illini will have a chance to keep their streak going. If the Tigers have their way though and force Illinois into mistakes, Mike Anderson may be able to claim Missouri�s first Braggin� Rights win in this millennium. It�s amazing Kevin O�Neill is still in one piece after the last two games he�s had to endure. First, Texas A&M steamrolled Arizona in Tucson for part of the game before the Wildcats roared back to win. Then, they once again fell behind against Illinois in Chicago, only to notch a comeback overtime victory. Now, Arizona is back in the top 25 and shaking its reputation as an underperformer. UNLV isn�t the same Sweet 16 team is was a year ago, but Lon Kruger can still pose a threat to O�Neill. And with the game being played on the Runnin� Rebels home court, Arizona will need to do more than just show up to escape with a win. Both Clemson and Mississippi have two games before they meet on Saturday, but if both can take care of business this will be a battle of undefeated teams. Clemson�s record is more impressive, with wins over Mississippi State and Purdue. UM has not faced very stiff competition, but a win against Clemson would prove to everyone the Rebels are a contender in the SEC, which is looking more and more wide open as the season goes on. After a disappointing loss to Illinois-Chicago to open the season, Bradley has won seven of nine and came close against Vanderbilt and Michigan State. Now, they�ll need to find a way to stop Butler on the road. An encouraging note for Bradley is that they did beat Wright State, who upset Butler, but don�t read too much into that game. Wright State, as a Horizon League foe, obviously knows something the rest of the country does not know, and that�s how to slow down A.J. Graves. Butler should dispose of Bradley fairly easily. Even though many focus on how Gonzaga is playing without Josh Heytvelt, the Bulldogs have shown they can play without him. Quite well, in fact. They could use his extra beef against Oklahoma, because Blake Griffin and Longar Longar have formed a very powerful frontcourt duo this season. The Sooners were impressive in a home victory over Arkansas this Saturday, and Gonzaga won�t have an easy time in Norman Thursday night. This one doesn�t really seem to fit on this week�s list, does it? It�s not a rivalry. Neither team is even very good. Plus, Duke is playing Pittsburgh at the exact same time as this game. When that game goes to commercials, though, you might want to switch the channel to ESPN2. Why? Because on one side, coaching Oklahoma State, will be Sean Sutton. And on the other side, coaching Oral Roberts, will be his brother, Scott Sutton. The game probably won�t be very good, but if you want to kill some time during a commercial break in Duke/Pitt, why not check to see how the sibling rivalry is going?